Because I didn’t have enough going on, I decided to join up with the Daring Bakers challenges starting this month. Actually, the reason I joined up was that with the “alternative” baking I’ve been doing, it’s easier just not to and there’s so much out there to experiment with. I figure the challenges will help push me to test my theories of Low-FODMAP baking while getting back to a bit of my pastry chef-roots. Inma ofÂ la GalletikaÂ was our Sept. 2013 Daring Bakersâ€™ hostess and WOW did she bring us something decadent and delicious! Pastel de Tres Leches or Three Milk Cake, creamy yet airy, super moist but not soggy… just plain delish! 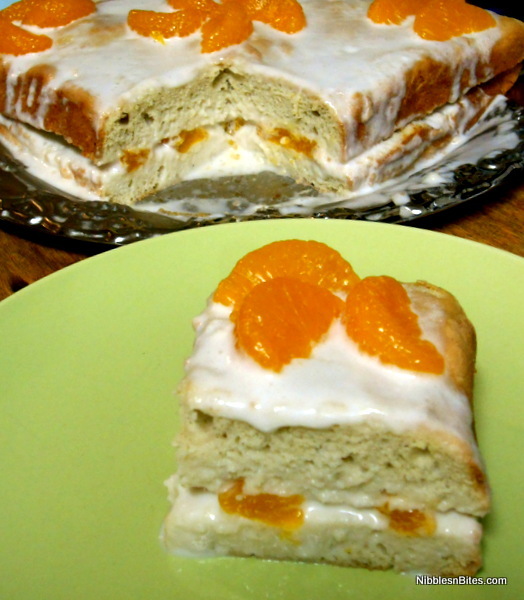 The base is a sponge cake and sponge cake is more about technique than ingredients. I have successfully made sponge cake before. While 3 milks (the translation of tres leches) may be asking a lot of someone who needs to avoid lactose, it’s different than needing to be actually dairy-free, so I had some wiggle room. 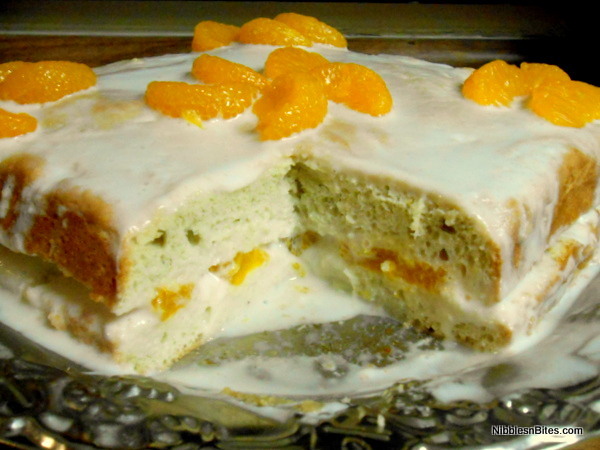 Top row: The golden brown sponge cake and the spongy texture inside.//Bottom row: Rather than a brush, I used the small ladle that came with my gravy boat to gently spoon the three milks syrup onto the split cake layers and my carefully arranged mandarin oranges in the center. The recipe we were given to use started with 5 separated eggs and used only 1 cup of flour. That’s why I think a sponge cake is a great type of cake for gluten-free or Low-FODMAP baking because the whipped eggs whites are providing both the leavening (lift) as well as the majority of the protein structure, so I was able to useÂ my go-to 5-Flour BlendÂ and 3/4 tsp of xanthum gum (though I probably could have left that bit out) with no problems. 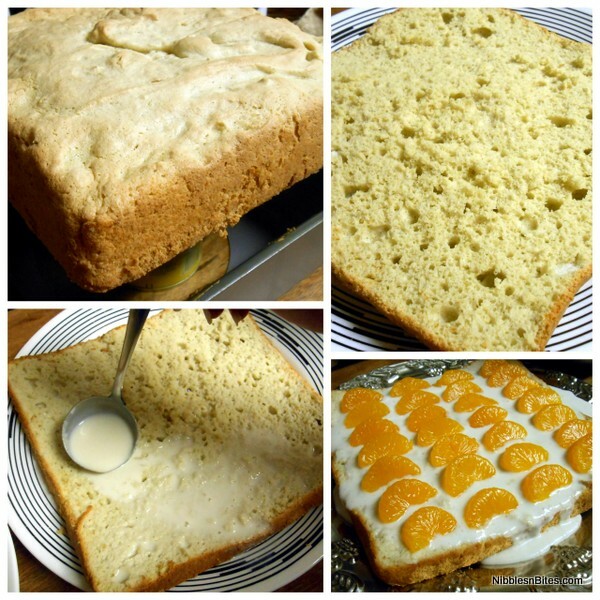 The technique for a sponge cake involves whipping the egg whites to stiff peaks and then gently folding the rest of the ingredients without deflating the whites. That’s where the danger lies. If you’re too forceful with that mixing, the eggs will lose the air trapped inside, the air that holds the place until the threads of protein coagulate (that really is the technical term) and can hold up the cake, and your finished cake will be dense and heavy and super-chewy. On the flip side, if you don’t mix it enough, you’ll have a streaky mess on your hands that won’t look or taste appetizing. No matter how well-made, a sponge cake is so named because it does have a texture than reminds one of a sponge and is usually a bit on the dry side. Which is why you should beware any recipe that does not come with or suggest a syrup or some other liquid be applied when the cake is still somewhat warm. ForÂ Tres Leches the syrup is comprised of three milks, usually evaporated milk, sweetened condensed milk, and heavy cream, and our version suggested flavoring with cinnamon and rum. Since evaporated and condensed (evap + additional sugar) milks concentrate the High-FODMAP lactose levels, they were definitely not going to be in my version of this cake. Instead, I opted to use 1 (13.5 oz) can of unsweetened coconut milk, 1 cup of lactose-free whole milk, and 6 oz of Velvet Cinn (a Horchata with rum and cinnamon made by Cruzan–reviewed on my cocktail blog). Now, the Velvet Cinn does contain milk, so there’s a little lactose in there (and rum is the only spirit not allowed on the Elimination phase of the diet, so can be problematic for some), but if you figure that a 9 inch cake yields 9 servings and there’s only 6 ounces of the liqueur in there, that’s under an ounce per serving and should be within tolerances for all but the most sensitive. Most of the alternatives I saw searching around included soy and almond milks, which aren’t really great from a Low-FODMAP standpoint. Rice milk is a good option, but you have to be careful which kind you get it to avoid High-FODMAP additives or sweeteners. In the end, my syrup was thick and rich and soaked into the cake beautifully and I had no adverse reaction to the Velvet Cinn component. TheÂ Tres Leches cakes I’ve had in the past were not filled with anything and I don’t remember them being topped with anything other than maybe a swirl of whipped cream and a maraschino cherry. For our version, mandarin oranges were suggested and since citrus is one of the easiest options on a Low-FODMAP diet, I decided to run with it. For the topping I suppose IÂ could have used non-dairy whipped topping but I really wasn’t wanting to go such an artificial route, I guess? So instead I mixed another can of coconut milk with some powdered sugar for sweetness, arrowroot to help thicken a bit, and a splash of vanilla. It wasn’t a thick topping, more of a glaze, really, but it worked. After chilling for a few hours I cut a slice for a pretty picture and because I was curious to taste how it turned out! That first night there was still quite a lot of coconut presence which is really no surprise with the coconut milk x2 and even some coconut flour in the cake. The next day, however, when I brought it out for our gaming group, the Velvet Cinn’s influence had asserted itself and the flavor was much more mellow. Overall it was a fabulous first-go with the Daring Bakers and I look forward to next month’s challenge!